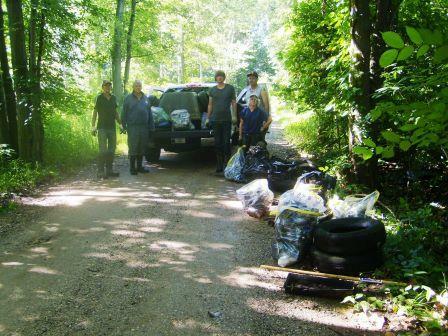 Thanks to the many volunteers who�turned out on�August 3rd�to help retrieve an unbelievable amount of litter�and tires from�our waterways. And thanks to the Van Buren Conservation District for organizing the event.� Click here to see more pictures�of a work crew working in Waverly Township.�Several other crews worked at other�sites near and on the Paw Paw and Black Rivers.� The ironic thing is that the folks responsible for the litter probably live nearby the dump site and may soon be drinking that which leaches from their litter. This page last updated on 11/16/2016.